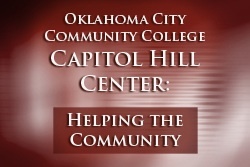 OCCC’s Board of Regents and President Paul W. Sechrist will be on hand at the grand opening of the Capitol Hill Center’s new location at 123 SW 25 St. Suite 100 in south Oklahoma City. The event will take place at 3 p.m. Friday, April 27. Sechrist explained that the Capitol Hill Center serves as an outreach center to the community. The classes offered at the center include computer skills, adult basic education, English as a Second Language, job preparation skills such as interviewing and resume writing, and leadership. “The grand opening is an opportunity to explain the courses offered at the center,” Sechrist said. Among the guests will be members of the college administration, community leaders, as well as the staff and students of the center. Sechrist anticipates that many of his faculty and staff from the main campus will also be attending the event. The Capitol Hill Center needs have far outgrown the space where it has been located, the Latino Community Development Agency. The LCDA’s hospitality has been greatly appreciated, Sechrist said. But to better serve the students and the community better, the Capitol Hill Center needs a larger space. “The new space is just temporary,” Sechrist said. “However the permanent space will be located on the main street of the Capitol Hill District. We are about to launch a private fundraising campaign to secure the funding to renovate the permanent space.” For more information, contact OCCC Community Development at (405) 682-7814.